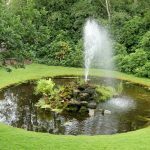 Home » Are Pond Aerators Worth the Investment? It’s steamy, it’s hot, and you can’t see a thing. It’s not a sauna. It’s your pond. It stinks and looks horrible. All your beautiful (and expensive) fish are floating on the surface. Something awful has happened in your pond. As a result, your carefully cultivated fish, plants, and crystal clear water are suffering. To prevent this from happening, you need to keep oxygen dissolved your water. Some of the very best additions to the health of your water are pond aerators. Need to learn more? Read on. What Kinds of Pond Aerators Are Available? A pond can sometimes develop layers that vary in temperature and oxygen density. The top layer is rapidly warmed, which creates water with lower density and decreased oxygen capacity. Lower layers of the pond are cooler water and decaying organic matter. Usually, cooler water holds more oxygen than warm water. In this case, the stuff rotting at the bottom of the pond is taking up what oxygen is available. Your fish live in the middle layers. A sudden change like a rainstorm, a strong breeze, or throwing a rock in the pond causes the layers to suddenly mix and “flip over.” This sends the oxygen-poor warm water to the bottom and the cool oxygen-lacking muck from the bottom to the top. The sudden decline in oxygen kills your fish, encourages algae to grow, and smells awful. The stinking black goo is heavy organic build up at the bottom of your pond. This is the rotting remains of fish waste, dead plant material, and other debris composting. The anaerobic bacteria (oxygen-hating bacteria) gives off sulfurous gases. Bacteria play an important role in the natural breakdown of organic waste in a pond. Proper bacterial balance with adequate oxygen can reduce bottom sludge significantly in a season. Pond aerators to the rescue! Pond plants use photosynthesis to naturally raise oxygen levels in your pond. An algae bloom is not only unsightly, but it can choke your plants and reduce your beautiful water feature to a swamp. Algae flourishes when the water is rich in nutrients. The overall ecology of a pond depends on effective management of wastes and oxygen in the water. Populate your pond with plants to consume fish waste and the nutrients from decomposing matter. Plants absorb nutrients and keep the water clear. Pond aerators help deliver dissolved oxygen to plant roots and encourage growth to keep algae at bay. One of the disadvantages of letting your pond turn into a swamp is the mosquitoes and other biting insects that take over. Still water is a mosquito breeding ground. A pond without fish or movement is likely to become quickly infested. Pond aerators keep water moving and encourage fish to remain active and near the surface. Invest in pond aerators to keep oxygen levels high and prevent water stagnation. Aeration adds oxygen to all levels of your pond reliably. This ensures that the top layer of water is not oxygen-poor and the bottom layer is sufficiently oxygenated to support your plants and fish. There are two basic types of aeration, surface and sub-surface. Both can be achieved with a number of techniques. When water makes direct contact with the air, it’s called surface aeration. Typically, oxygen is gained through a fountain, waterfall, or spray. In general, surface aeration methods aren’t enough to boost oxygen to healthy levels in your pond. With surface aeration, only the topmost levels of water are affected. Subsurface aeration works by adding air at the bottom of the pond, directly on the pond liner itself. These bubbles rise to the surface and naturally agitate the water. Oxygen from the bubbles mixes with the water. For best results, you want oxygen added to the oxygen-deprived top and bottom of your pond. 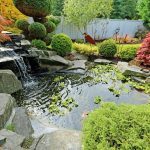 A fountain or waterfall mixes only the surface of the water, while a bubbler beneath the surface does little to enhance the beauty of your pond. For your surface pond aerator, you need to correctly calculate the size of your pond in gallons, the height you want your water to fall, and the width of the waterfall. The rule of thumb is that you want to move at least half the volume of your pond per hour. So for a 1,000-gallon pond, you need a pond pump/solar pond pump rated at least 500 gallons per hour to move water through a waterfall and filtration. This size pump will give you a waterfall about a foot wide and two feet high. You may find that isn’t enough if you want a wider waterfall or need to lift your water higher. A sub-surface aerator (properly called a diffused aerator) is made of three basic components. They are a compressor, some tubing to carry the air, and the diffuser. The diffuser is the piece that bubbles at the bottom of your pond. You should consider the size of your pond and the surface area when deciding on your diffuser. There are types that force air through a semi-permeable membrane in a very fine mist of bubbles. There are also stones, perforated tubes, rigid tubes, and plastic blocks. Select your aerator based on the maximum life cycle duty with a low risk of failure. Low maintenance is also important, as the unit must run without interruption. Of course, make sure your compressor is correctly rated for outdoor use and your power cord and air tubing are long enough to service your pond. 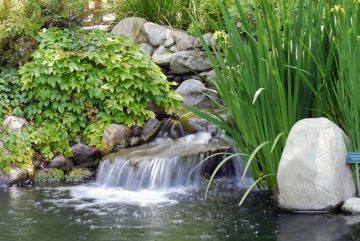 Keeping your pond beautiful and healthy requires taking care of your water. Adding dissolved oxygen with surface and sub-surface aerators reduce unsightly pond sludge and encourages beneficial bacteria. Pond aerators also discourage algae blooms and mosquitoes. Follow our page for recommendations and reviews of the very best pond aerators for your pond.